Evaluating your ocular health is crucial. During a complete eye exam, both your vision and ocular health will be measured and evaluated with distinctive tests. Tonometry: Measures the fluid pressure in the eye; important test in detecting glaucoma. Peripheral vision: Identifying how wide your peripheral vision is will assist in detecting neurological and retinal diseases. Corneal topography: This provides the most detailed information about the curvature of the cornea. It is useful in diagnosing corneal conditions and measuring to fit contact lenses properly. Retinal exam under dilatation: Dilating the pupil with eye drops enables the Optometrist to obtain a much better view of the retina, optic nerve and vessels at the back of the eye. 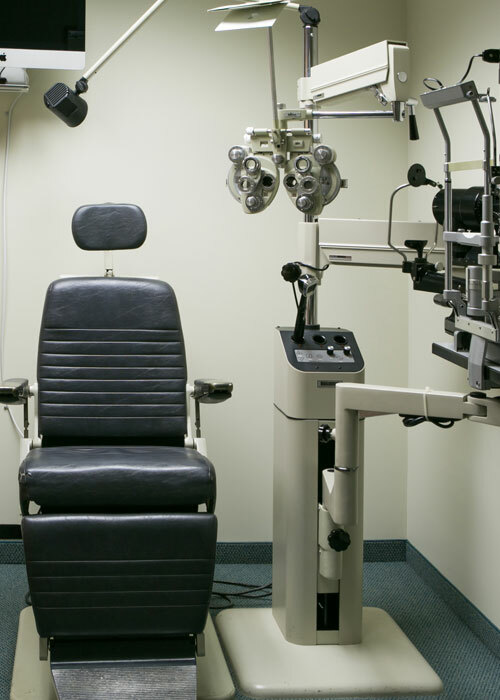 Thanks to this simple exam, the Optometrist is able to gather a lot of important information. In fact, some systemic diseases such as hypertension and diabetes are first discovered during a dilated eye exam. Retinal photography: Allows your Optometrist to keep a permanent recorded image of your retinas for later comparison. This can assist in the detection of ocular diseases that have no visual symptoms.